EDC Card Special Edition - This Special Edition model comes with a weapons grade ceramic coating applied, to create a non-reflective surface for a discreet look. The back of the Special Edition EDC Card has laser etchings to designate tool sizes. CPM S35VN Blade Steel. Inspired by high-end outdoor/military knives, the Everyday Carry Card follows the EDC credo of usefulness, minimalism, quality, and high versatility all in a handheld package that consumes little space. Unique Features: - First of it?s kind to be manufactured with S35VN - Handheld torque positions: Unique torque position for tough hex fixtures. Hold upside-down using open hex drivers and thumb grip. - 2.84mm thick for maximum durability. Fits in all wallets tested. - Modular?utilizes an o-ring system for unique tasks using hex bit shanks. - TSA compliant. 30+ functions: - 23 hex wrenches, metric and imperial: - Closed Hex Drivers ( 2.5mm, 3.2mm, 4mm, 5mm, 1/4", 8mm, 10mm, 7/16", 13mm, 9/16", 16mm, 11/16" ) - Open Hex Drivers ( 3/16", 5.5mm, 1/4", 8mm, 10mm, 7/16", 13mm, 9/16", 16mm, 11/16", 19mm ) - 1/4" hex driver with optional o-ring retention, designed to hold any 1/4" screw bit shank for unusual fixes. 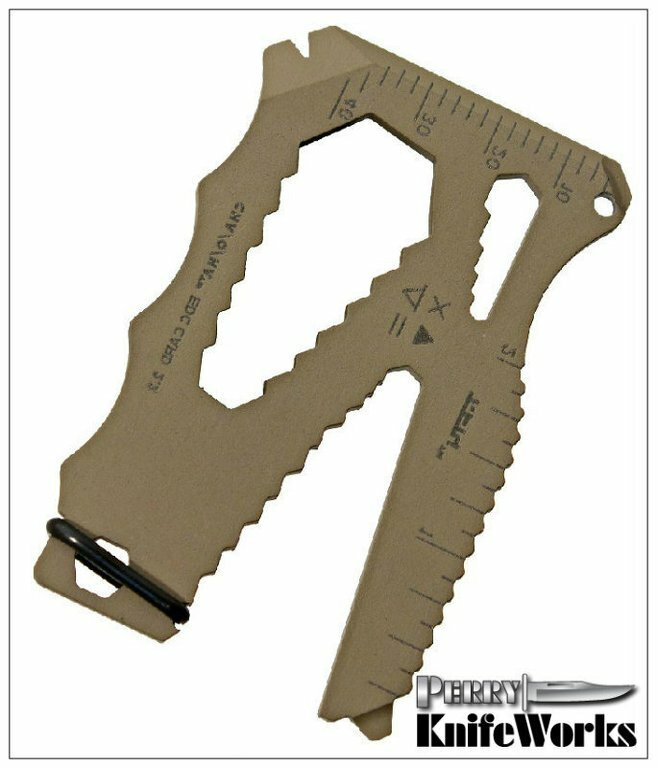 - 5 x 0.8mm flathead driver - #2 phillips driver - Bottle opener (open hex driver) - Lanyard Hole - Prybar with nail lifting slot - Tapered straight edge - 2" imperial ruler - 30mm metric ruler. Made in the USA!